Although Bungie kept this pretty quiet during the Destiny livestream some avid fans spotted the sword weapon, both in the vault and on the back of the player in the Tower. Known as Arc Edge the sword is a Legendary melee weapon that players can equip in the character loadout screen. "The dark heart of Willbreaker burns within this blade"
Unlike the other swords we've encountered during the early Moon mission (The Sword of Crota) and The Dark Below's raid (Crota's End), this sword appears to be a equippable version that stays with the player. Known as Arc Edge, the sword is a Legendary weapon that presumably occupies one of the weapon slots or possibly the new Artifact slot. It has Arc damage so presumably can be used for offense attacks as well as defence which is described by it's unique perk (see below). "Use L2 to guard. Effective against Solar and Void attacks, less effective against Arc attacks. So although this weapon is an Arc weapon and is going to deal bonus Arc damage, it's more effective at defending against Solar and Void attacks. We can probably guess that Speed, Impact and Range relate to the attack side of the sword, effectively informing us how well it's going to swipe at enemies. The other stats such as Efficiency, Defence and Energy are less specific and I'm interested to see what Energy relates to. 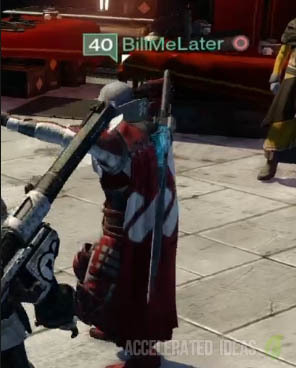 Take note of the player with name tag BillMeLater, the sword is clearly visible on his back. 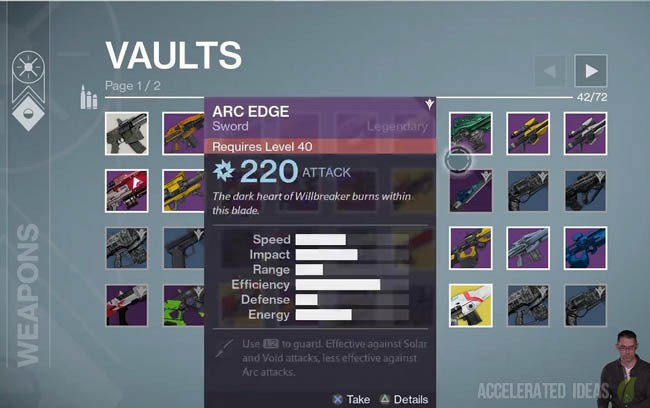 It can also be seen very briefly in the new extended vault. Guardian wearing a sword in his back.